Roll-N-Go Cosmetic Bag is your best travel buddy for cosmetics and toiletries. The Roll and Go Cosmetic Bag holds everything in separate compartments. With 4 spacious zippered compartments, Roll-N-Go as seen on TV can hold and store cosmetics, toiletries, jewelry and more. 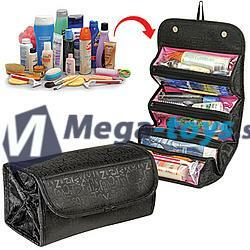 This compact yet roomy cosmetic and toiletry bag stores easily and made with a convenient hanging loop. Wipes clean. Polyester. Rolled up measures 10” x 4 ½” x 5 ½”. Rolled out measures 10” x 20”.